Just like MV member Geo recently did, I also fulfilled a long held wish to climb Slieve Carr. Carr is widely held to be the most remote hill in Ireland, using a definition of being furthest away from roads, houses and people. The summit is about 14 kms from the nearest road along the Bangor Trail. The Trail is a 30km route that takes you through the area of near-wilderness of North Mayo in which Slieve Carr is situated. The Trail is little more than a guessing game at times as it passes through the most remote expanses of bog, and you need your wits about you when the bad weather closes in! The Trail skirts the SW slopes of Carr, and most people approach Carr from the north or south along it. Other hardy souls make a beeline from the west or east across vast expanses of bog or through kilometres of forest. This route is shorter, but equally challenging. It’s also possible to combine Slieve Carr with Nephin Beg. Rather than going for a marathon 28km there-and-back hike in one day, I opted to stay overnight at a ‘tin bothy’ I had read about near the half way mark of the Trail. I planned to head to the bothy and sleep there after climbing Nephin and Carr. I started from the south and followed the Trail for several kms. This section is well marked, easily followed and a great warm up as you follow a river valley. Nephin Beg S Top is reached after about 4.5kms and I branched off the Trail to climb it. From here I continued on to the main Nephin Beg top. The views back to Glennamong and Corranabinnia were great in between the heavy rain showers. After Nephin Beg there is a steep descent to the col with Slieve Carr. Carr presented as a hulking mass with steep sides from this angle. I had a heavy rucksack weighing 18-20 kilos. Because of this I was slowed down considerably and I was tired after several hours walking after an early start driving from Dublin. I decided to head straight for the tin bothy and attempt Carr the following morning. As I diverted back down onto the Bangor Trail in the vast bog below I dreamed of a comfortable, warm bothy, with a fireplace and furniture. 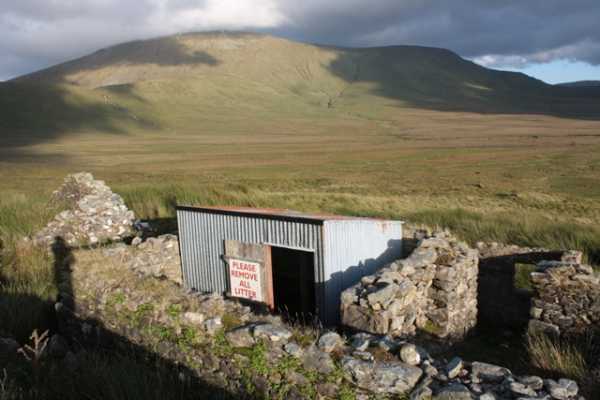 I wearily reached the tin bothy an hour from Nephin Beg, my rucksack getting heavier in the trudge through the bog. As I reached the bothy I was presented with the sight of a ramshackle tin box with a hole in the roof and broken plywood floor. As I stepped inside the 7 x 9 foot box the floor cracked further as it was soaked from the rain coming in the open door and broken roof. I made the most of it and had a surprisingly comfortable night, enjoying the absolute silence of this most remote of Irish places.